Indicated clearly in the out-workings of phase one of the Brexit negotiations is that Northern Ireland will experience some hindrance to its status quo market access. agendaNi outlines the most up to date sales and export figures for the Northern Ireland economy. While Brexit has altered the flow of goods, services and people in Northern Ireland to some degree (for example, the impact of sterling depreciation, relocation of businesses and downward migration fuelled by fear), it is worth noting that the full effect of the UK leaving the European Union will not be fully evident until some years after any deal’s conclusion. Even a transition period, if one is agreed, will not offer a full indication of the likely market changes and those changes will largely depend on what form of a deal is struck. However, the Northern Ireland economy has been a major focus in the first stage of Brexit given the prominence Northern Ireland was afforded by the EU during phase one. As the DUP have highlighted in advocating against any divergence from the same exit terms and conditions of the UK as a whole, the UK market is crucial to the Northern Ireland economy. However, in focussing solely on the UK single market, they fail to recognise the potential damage done to Northern Ireland’s economy if trade links between the Republic of Ireland or Europe were hindered. The latest figures produced by NISRA, who in 2015 introduced a comprehensive measure of local businesses’ sales to markets outside Northern Ireland, relate to 2016, the year of the Brexit referendum. These figures should act as a good comparison for analysing the post-Brexit impact. Sales by companies in Northern Ireland rose by 2.7 per cent in 2016 to £68.9 billion. Within Northern Ireland, sales increased to £44.7 billion by 1.9 per cent. Sales to the GB market increased by 2 per cent to £14 billion, however the greatest rise was to sales outside of the UK, which rose by 7.3 per cent to £10.1 billion. 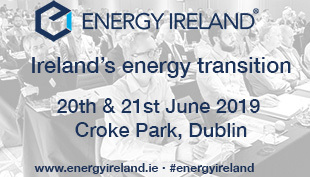 Within these external markets, sales to the Republic of Ireland rose by 2.2 per cent to £3.4 billion. While sales to the rest of the EU (excluding Republic of Ireland) increased by 9.4 per cent to £2.3 billion. Exports to the rest of the world increased by 10.4 per cent to £4.4 billion. In 2016, the number of Northern Ireland companies selling to markets outside of the UK rose by 0.7 per cent. Northern Ireland’s largest exporter in 2016 was the manufacturing sector (£6.1 billion, 60.5 per cent). This was followed by wholesale and retail trade (£1.8 billion, 18.2 per cent), information and communication (£569 million, 5.6 per cent) and professional, scientific and technical activities (£442 million, 4.4 per cent). 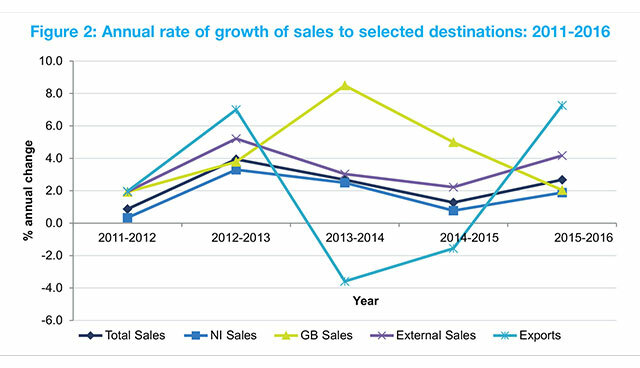 While 2016 represented good performances for the Northern Ireland economy across all markets, the below graph highlighting the annual rate of growth of sales from data was collected in 2011. It shows a declining rate of growth for sales to GB, a worrying trend given a move towards greater reliance on this market post-Brexit.